Click here for an extended essay on the prints in this show at the Toshidama Gallery Eblogger site. 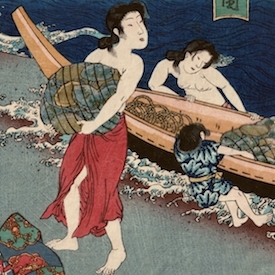 Welcome to the first new show of Japanese woodblock prints of 2019 at the Toshidama Gallery. We have grouped them under the title, 'Brocade Pictures'. This was a term that was in use from the inception of colour woodblock printing in the 1760's until the Meiji prints of the late nineteenth century. The term invokes richness, and the prints in the show are full of that delight in colour and texture and pattern. The outstanding print in the show is probably the wonderful Yoshitoshi triptych of The Assassination of Ii Naosuke. 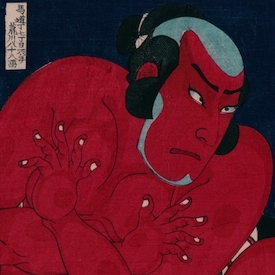 This print is unknown in the catalogue of Yoshitoshi prints. The subject (to be confirmed after the translation of the cartouche), is likely to be the assassination of a senior Japanese diplomat, felt by some to have betrayed Japan, but these days resurrected as one of the architects of the modern state. It as an important print, unique as far as one can say and in fantastic condition. Elsewhere in the show are two fabulous Kunichika okubi-e which make a fine pair of opposing prints from a short series of three prints commemorating the performance of Imoseyama Onna Teikin from1883. Two more prints from the Comparison of the One Hundred Ogura Poets series by Kuniyoshi and an especially fine diptych of the magician and thunder god Narukami by Kunisada of 1851. One of my favourite prints this season is the stunning portrait of Ichikawa Danjuro playing the Pirate Chief Kezori Kyuemon from 1894. There are some outstanding pieces in this selection and we are still trying to keep our prices as low as possible. There is a new essay discussing the relevance of onnagata and gender on our eblogger site and our Wordpress site is once more carrying regular posts on alternative aspects of each print updated on a weekly basis. If you are new to the site, please join our mailing list and receive around ten newsletters a year alerting you to a new selection and offering discounts between 10% and 50% on selected prints.